The moment you do that it changes everything! I reckon food is here for two reasons; to nourish you and to share with the people you love – and sometimes that means indulging! The odd little treat here and there is good for the soul and you can always make your next meal a salad. Enjoy the moment and don’t deprive yourself, it’s not worth the worry!! Mindful eating is pretty swell and really helps to bring you back to the moment. We often eat in a rush on autopilot – sometimes I even forget what I’ve eaten! It’s pretty special to be present and notice the smells, textures, flavours and who you’re enjoy your meal with. It also helps to tune into your body, knowing when you’re satisfied and full. Before a meal I like to take a little moment to appreciate how lucky I am to be healthy enough and to have this meal. I find this ritual really puts things into perspective for me. Now I’m not talking about skittles here! The broader variety of fruits and vegetables we consume, the broader the spectrum of “phyto-chemicals” (a fancy way of saying plant nutrients), so get as many colours as possible into your meals to up the nutritional quality! I know this sounds like a simple one but the first sign of dehydration is actually hunger. By the time you feel thirsty, you’re already dehydrated so up the water. Aim to drink a minimum of 1 litre of water per 22kg of body weight per day! Try adding blueberries, chopped strawbs and mint leaves to your water bottle to mix things and give a hint of flavour. Feed your body what it needs. In the winter months we crave more root veggies and foods higher in complex carbohydrates like carrots, parsnips, spuds, sweet spuds and pumpkin. We also go for heavier meals like slow cooked casseroles and curries full of warming spices. Then comes summer time and without thinking, we crave fruits, which are naturally higher in electrolytes (we need more of these when we sweat!). It’s almost like Mother Nature does the thinking for us! Finally, this isn’t so much foodie but more about a healthy mind (which will ultimately effect the body and soul). Surround yourself with people who love you just the way you are but inspire you to be more. I think it’s important to have positive souls around you and people who support not only your health journey but also your passions and loves. Ready to put it all into practice? 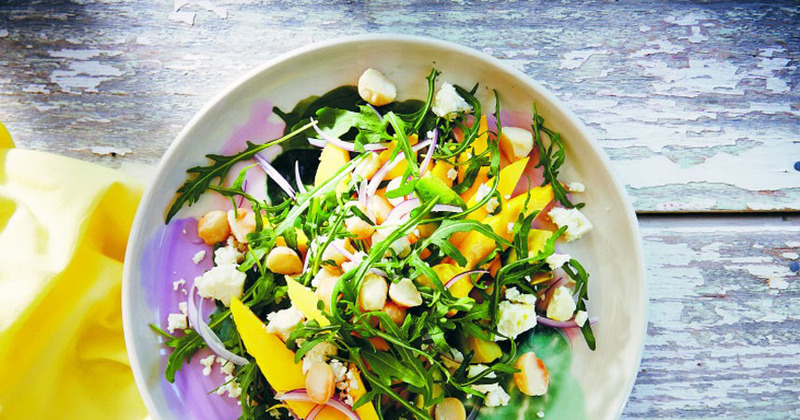 This salad is from my new book Summer Food and is a cinch to make. It’s something I whip up every single Christmas, and year after year it’s the first thing to be gobbled up. Avocados are a good source of fibre, potassium and vitamin C, and although they are high in fat, it’s the good kind. I definitely notice the more good fat in my diet, the better my skin and hair health is. Serves 4-6. Lightly toast the macadamias in a small frying pan over low heat for 1–2 minutes, shaking the pan so they toast evenly (you won’t need to add any oil as they will release their own). Place the avocado, mango and macadamias in a large bowl and mix. Add the onion and stir through gently. Lastly, add the rocket – make sure it’s dry so it can soak up all the amazing flavours – and goat’s feta and give it a very light toss with your fingers. To make the dressing, whisk together the lime juice, lime zest, olive oil, mustard and honey in a small jug or bowl. Season to taste. Pour the dressing over the salad and toss lightly with your fingertips so it coats everything but doesn’t bruise the rocket leaves. Then top with a bit more goat’s cheese and serve. I reckon this will be a favourite!